The content of this page was updated on 8/14/2012, but the latest multipliers are listed here. Somewhere else, homebrewers are debating the merits of continuous sparging vs. batch sparging. Among commercial brewers, there's very little debate: continuous sparging rules. 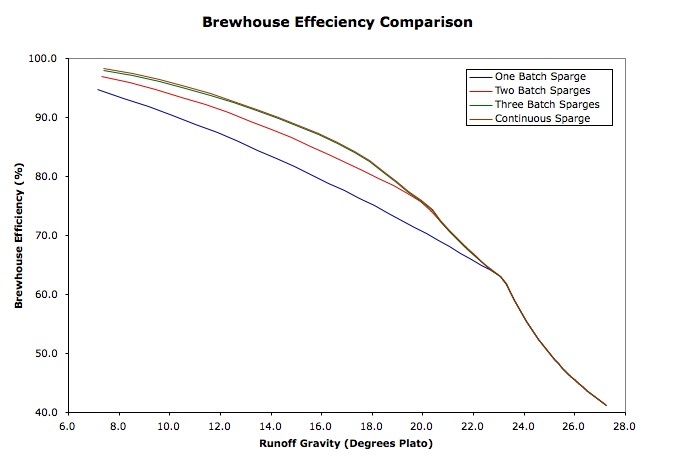 Here, I'm going to illustrate how a batch sparging simulation can help you predict your brewhouse efficiencies regardless of the sparging method you actually use. How's that for diplomatic? 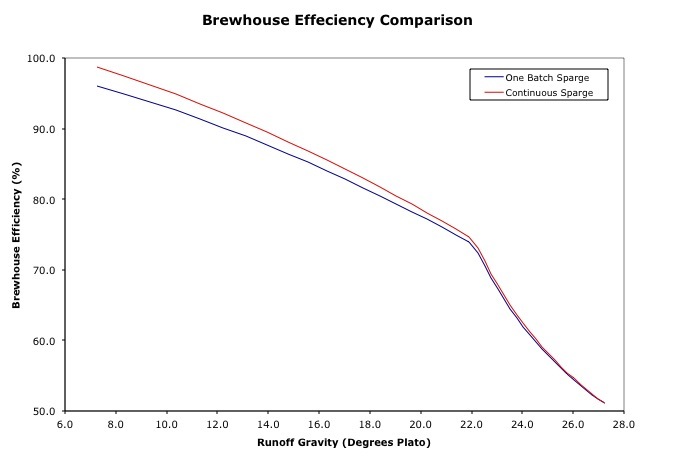 As you probably know, brewhouse efficiency decreases as runoff gravity increases. To understand why, it helps to view mashing from a new perspective. Typically, we think of using more grain as a way to increase the gravity of a fixed volume of wort. Instead, you should think of using more grain as a way to increase the volume of a low-gravity wort. When you brew a high-gravity beer, you simply stop lautering before the full volume of wort can be collected. Because sparging dilutes the wort exiting the lauter tun, stopping the runoff early results in a higher-gravity beer. However, it also leaves more sugar behind in the lauter tun. The end result is that the small volume of high-gravity wort has less total sugar than the large volume of low-gravity wort that could have been collected from the same mash. That's why gravity comes at the expense of efficiency. Batch sparging is a powerful tool because it's easy to simulate. By entering a few calculations into a spreadsheet, you can quickly determine the runoff gravities and brewhouse efficiencies for different amounts of grain. 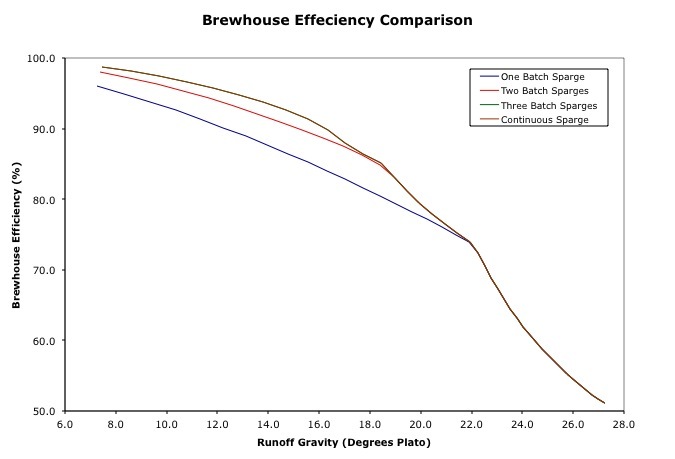 If you assign a maximum brewhouse efficiency for continuous sparging and assume that batch sparging and continuous sparging will have the same minimum efficiency (essentially a no-sparge situation where you only collect the first runnings), you can create an efficiency curve for continuous sparging by starting at the maximum efficiency point and linearly decreasing the difference between the two sparge methods until they converge at the minimum efficiency point. 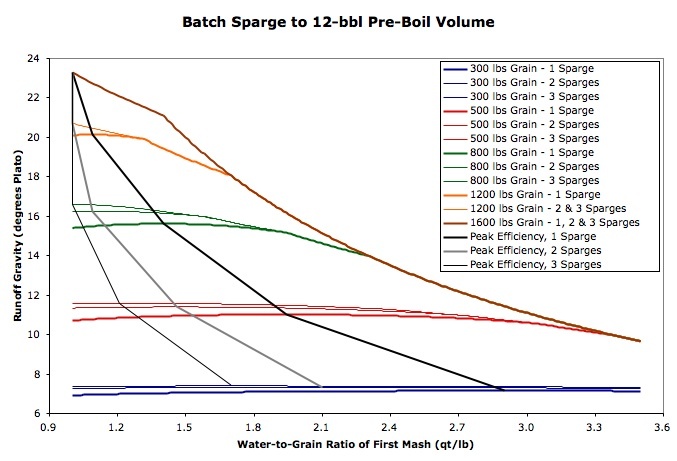 The method can be refined by optimizing the water-to-grain ratio for each grainbill and generating additional curves for multiple batch sparges, e.g. sparging twice for a total of three runoffs. 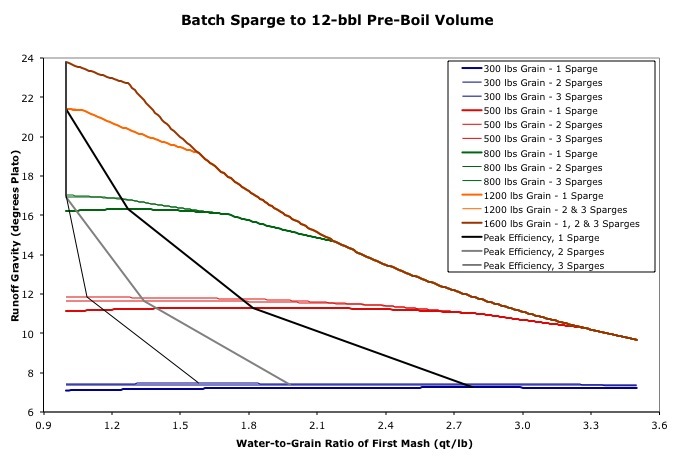 According to Kai Troester's Batch Sparging Analysis, batch sparging is most efficient when the runoff volumes are equal. I didn't assume that was true when I started, but I ended up with the same result after running my calculations over a wide range of water-to-grain ratios. 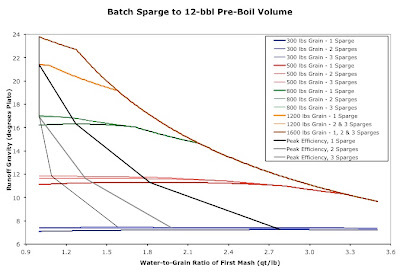 Here's a graph that shows the peak efficiencies - represented by runoff gravities - over a variety grainbills, water-to-grain ratios and number of sparges. 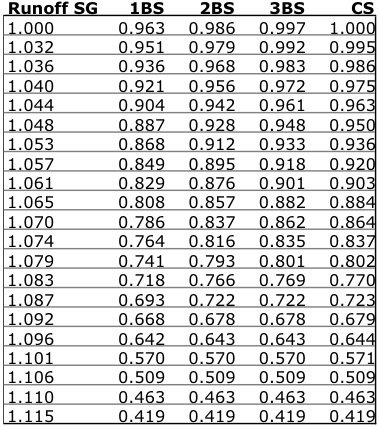 Using the ideal water-to-grain ratio for each simulated condition resulted in the efficiency curves shown below. 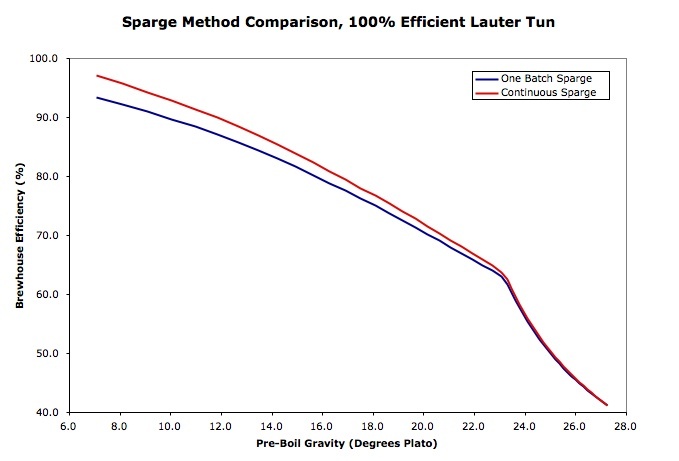 The curve for continuous sparging was created, using the same method described above, from the curve for three batch sparges. The simulation assumes a perfectly efficient lauter tun, which means that all inefficiencies are due to spent grain wort retention. 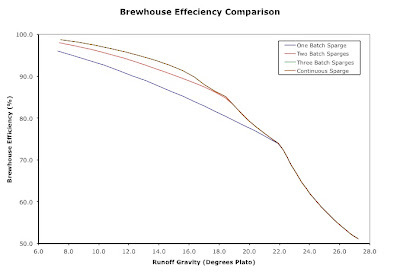 That allows me to account for equipment efficiency in a separate variable, the maximum brewhouse efficiency of a given brewery, which will eventually be multiplied by the brewhouse efficiency curves to predict a final brewhouse efficiency value for a target runoff gravity. To make that as easy as possible, I converted the curves into multipliers by dividing them by the maximum brewhouse efficiency of the continuous sparging curve. 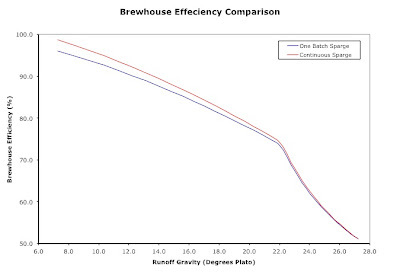 If your max brewhouse efficiency is 85% and you want to brew a beer with a runoff gravity of 1.065, you should assume a brewhouse efficiency of 0.884 x 85 = 75.1% if you'll be employing a continuous sparge. 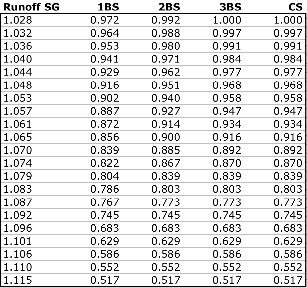 Basing the continuous sparge values on a batch sparging simulation may not exactly represent what happens your lauter tun, but it'll get you pretty darn close. If you'd like to check out the simulation itself, you can download it here. I just found your site and found it very helpful. We are currently in the planning phase for a new craft beer brewery in the Northeast USA called Nor'easter Brewing Company LLC. Information on efficiencies and other brewery processes and systems is very helpful. Thank you.